I work in Norwell, MA as a special education teacher and an ABA therapist for students with autism for a private firm. I just finished Wilson Level 1 Certification in June 2015, and have training in Applied Behavior Analysis, Project Read Written Expression, John Collins Writing, and extensive experience providing specially designed, differentiated, and multi-sensory instruction to elementary- aged students. I have worked with programs such as Project Read Written Expression and Phonology, SPIRE, John Collins Writing, TouchMath, and Envision Math. I have previous tutoring experience in multi-sensory reading with second, fourth, and fifth grade students, and math with fifth grade students. 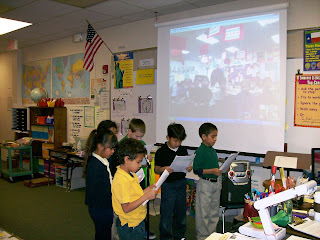 My students sharing an excerpt from MLK’s “I Have a Dream ” speech while the other class watches and listens via Skype. What a fun day we had Skyping with a 3rd grade class in suburban Chicago. My students read their reader’s theater excerpt from Dr. Martin Luther King’s “I Have a Dream” speech and the other class shared some of their writing. Afterwards, the students asked each other questions. We learned that a Chicago Dog has a bunch of stuff most second graders don’t like and that deep dish pizza sounds really good. My students shared their favorite sports teams and their ancestral heritage. During the call we also discovered that both classes have blogs so we made a plan to read and comment on each others’ blogs! My students really enjoyed the experience and asked if we could do it again! Hi! Thanks for posting this! We have come along way since our first Skype session in February. We have since Skyped with a former astronaut and will be Skyping with Dr. Neil deGrasse Tyson in a few weeks. Skype is a powerful communication and learning tool! Visit http://www.frugalteacher.com for more posts on our Skyping experiences!